If, by chance, you are planning to invite an international student to your home for the holidays, allow me to warn you. Your invitation, offered in the name of cross-cultural solidarity and holiday cheer to some upstanding young man or woman with a charming accent and in need of a home-cooked meal, could lead to an unprecedented chain of events, after which you may never be the same. Your car might break down at 11 pm on I-65 somewhere between campus and your parents’ house, stranding you and the international student at a gas station. You may pass the time playing frisbee and learning Arabic greetings in the deserted parking lot as you wait for the tow truck and your mom and dad to arrive. You might learn on the drive that he single-handedly found families to host all the other international students in need of a place to stay over the holiday weekend so that he could be the only one accompanying you. “You’ll love Miami,” the international student may have told the music major from Myanmar who has always wanted to go to Nashville, where your family just happens to live. Your family may take him along on their day-before-Thanksgiving tradition of pancakes and hash browns at Shoneys, and your dad may try to convince the international student (and almost succeed) that if they sing “Tradition” from Fiddler on the Roof, the breakfast bar is free. He may kneel when he meets your grandmother who has Alzheimers and never made it far from Alabama. The international student may take her hand in his and tell her he is from Damascus, “like in the Bible,” which may prompt one of the few smiles she will give all year. You may not realize he is watching as you paint her fingernails to the marching band sounds of the Macy’s parade and your mom shuffles casserole dishes from the oven to the table, but the international student may tell you years later that was the moment he fell in love. He may ask to come back at Christmas, and you may prepare a basket for the guest room with cookies and hotel shampoos, causing your mom to say, “You really like this boy.” You may deny it, but then return to campus after New Years and tell your roommate over a box of Fudge Stripes you think this international student could be the one. He may ring the doorbell at your student apartment, then run away to watch you find the giant jar of olives he left. The international student may introduce you to Arabic coffee and teach you to crack pumpkin seeds with your teeth, and you may say they go better with iced tea. Your pants may shrink a size or two as you realize the heartfelt tenacity of Middle Eastern hospitality and the futility of resisting appetizers and desserts. You may take a bike ride a year later, just weeks before graduation, and stop to rest under a gazebo, where the international student may pull a nursing textbook from his backpack and say he wants to show you something to help your irritable bowel syndrome. You may turn to the suggested chapter and find a hole carved in the pages, hiding a ring box. You may remember how the international student said on your second date that you are like a wild bird that should never be caged, and you may say yes, despite your fears. You may be surprised, both good and bad, by the reaction of others. A customer at the coffee shop where you work may say that the international student is marrying you for the green card and another may ask if you’ve seen Not Without My Daughter and warn you’ve no idea what you’re getting into. Your boss, though, may hire the international student, paying him a fair wage to make cappuccinos despite his lack of a work visa. Your mom, who has grown to like this international student but worries, may ask, “Wouldn’t life be easier with a boy from up the street?” You may think of the boy from up the street who buried your My Little Ponies in the mud and say, not really. The international student may not tell you his mother makes an international call every day begging him not to marry this American. He may not tell you until after you’ve flown across the world to meet his family and won their hearts honestly. Even then, you may suspect it was really your orange polka-dot pajamas that charmed your future mother-in-law, but you’ll take it. You may have a wedding in his country and another in yours, arriving at the former with a horse and drummers, and departing the latter in a VW van. You may still laugh years later at how he balked in Birmingham at throwing the garter from your thigh to a pack of unwed men, or how you were up til dawn in a Damascus hotel room dismantling the zealous work of the hairdresser while the international student plucked fake lashes from your khol-lined lids. Your family gatherings may become much more entertaining. The international student may make your mom spew her drink when he misses the subtle difference between Devil and deviled and asks her to pass the Satan eggs. She may make it her personal duty to remedy his dislike of ham, but she’ll still add a turkey to the table each Christmas especially for him. The years may fly by and you may forget what it was like to not be subject to “random” security checks or the worry that comes with having family far away in a place of unrest. The sharp edges of your cultures may wound each other unintentionally and at times take you by surprise. But you will not forget, even as the years fly by, that the harmony is richer because of the struggles and that that faraway place is now a part of you too. You will learn together which of the sharp edges deserve to be blunted and which ones to keep as they are…but to handle with care. You may watch his mother and yours, who don’t speak each other’s languages, laugh as they sled down a hill holding on to one another, and you will know that some things are stronger than cultures or words. It may, of course, lead to nothing at all. It may simply mean another place setting at the table, another slice cut from the pumpkin pie, another friendly face in the shuffle of passing plates and giving thanks. But the thing is, you never know. Vicki Valosik is a freelance writer who likes polka dot pajamas and once invited an international student home for Thanksgiving. The pair now lives with their two cats near Washington DC, taking the occasional bike ride and snacking regularly on pumpkin seeds. More of Vicki’s work can be found at vickivalosik.net. Vicky, I love love love this piece (and, being that I now have a kid, I pick up on the allusion here :)). This is just wonderful. So touching and heartwarming and funny all at once, along with the clever structure and allusion. So great! Eva, thank you so much for your lovely and sweet words. You made my day. A compliment coming from a great writer means a lot! This is beautifully written! I am Tara & Zeb’s friend from Atlanta and have heard so much about you and your international student. 😉 While I was not an international student, I am also from the Middle East and married an American. So some of these hit close to home. Tamara, I have heard so much about you too! Thank you for leaving a comment. I hope our paths will cross someday. Gorgeous and stirring and beautifully told. Thank you so much, Claire! I really appreciate your kind words! Satan eggs! 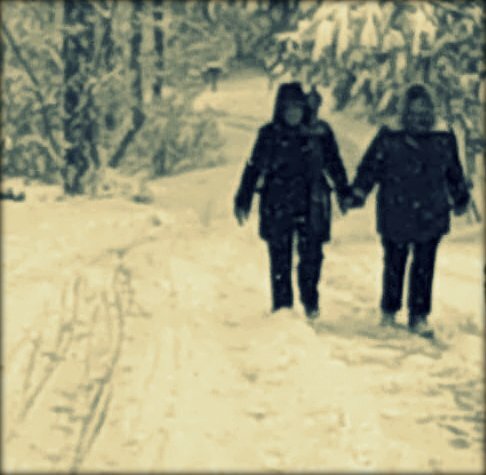 Wonderful 🙂 But nothing is as wonderful as the image of your mother and mother-in-law sledding down a hill together. My family still laughs about Satan eggs! Thank you for your comment! Fantastic! The guy who buried your My Little Ponies really lost out! I love how your pieces fit together – you have the makings of a book, dear. As the American girl who just arrived home from my first holiday home to Kenya with my own “international student” – thank you. Yes, the sharp edges can rub at times. But I also trust that my life is so much richer for the contrasts. I pray that I might also have won my future MIL over honestly. It’s funny how being with someone from another culture makes you understand your own better (and become aware of its sharp edges). I hope you and your “international student” have a beautiful life together. We were both international students. His family is unhappy about the white american girl and the baby she carries. I love how you wrote about sharp cultural edges. They are why today has been a weepy one, but I love that life sent your blog entry my way. Thank you so much for your thoughtful words. Vicki, I love you and your international student and his family (especially his mom). Even though she and I can’t speak each other’s languages we can communicate through “mom-isims”. She and Fisal raised a great guy and we consider ourselves lucky to have him in the family . We love it, too, that our family has doubled in size with the addition of our international family. I hope the piece you wrote will open the eyes and hearts of other families who invite an international student home for Thanksgiving! Thanks, Mom. We love you too. What a delight this is, funny and deeply touching. I’ve shared it with friends who will enjoy it as much as I have. Congratulations Vicki. Thank you so much, Ed. You’ve made so many people, including me, better writers by helping us understand the tools we have with which to express ourselves. The first commenter said she understood an allusion “now that she has a kid”..what allusion to kids?…?…? What?? It may or may not have been intentional, but there’s a children’s book called If You Give a Mouse a Cookie that talks about what happens when you take one simple action and then there are cascading consequences. (http://www.amazon.com/Give-Mouse-Cookie-Mini-Give/dp/0061128562) Actually, it’s a whole series now. We have one of the spin-off ones. Such a lovly post- thank you so much for sharing it with me! Thank you so much, Kelsey. Vicki – I loved it. I just kept thinking “humor with heart, humor with heart” as I read. My heart would be squeezed a little, and then I’d chuckle with the little images and phrases you sprinkled throughout. Then squeezed…..then chuckling…..The rhythm and pace — beautiful. My first perusal of Outside In — I’m really glad I happened to click randomly on the issue that had this piece. Thank you!